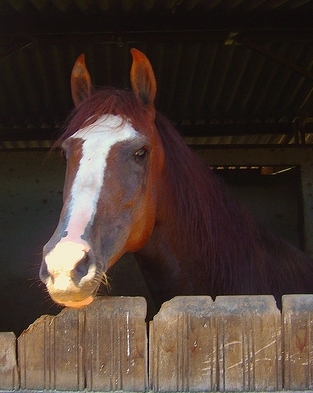 The Pet Wiki > Horse Articles > What are some illnesses affecting Horses? April 1, 2012 Comments Off on What are some illnesses affecting Horses? Vaccinations against certain illnesses will help keep your horse healthy. Your vet will determine which vaccines are necessary and how often to inoculate. Horse illnesses often mirror similar symptoms so regular veterinary checkups will help as a preventive to illness. If you see any behavioral changes or signs of illness in your horse, always consult your vet. Colic is abdominal pain caused by gas or spasms. Symptoms may be pawing the ground, lying down often, kicking the abdomen, rolling on the ground or curling the upper lip. Strangles is caused by the streptococcus equine bacteria. It is highly contagious from horse to horse and is spread by nasal discharge or burst abscess. Vaccination and good hygiene, keeping the barn clean will help prevent this disease from spreading. 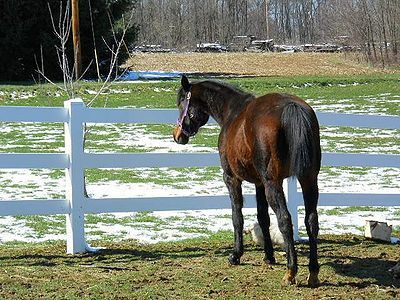 Equine Herpes Virus can cause respiratory distress, abortions, fever, neurological disorders, paralysis and death. Pfizer Pharmacueticals makes a modified live virus (MLV) vaccine as a preventive. Navicular Disease or Syndrome is a gradual degeneration of the Navicular bone located at the back of the horse’s foot near the heel. It also affects surrounding tissue. While there is no cure, anti-inflammatories, painkillers and shoes that put less stress on the feet are temporary reliefs. Check with your vet for more in-depth information. Degenerative Joint Disease (DJD) is a type of osteoporosis in which the joint swells and the cartilage breaks down. DJD is painful and results in lameness. It can be caused by old age, injury, weight or overwork. Depending on how advanced the disease is your vet will recommend the proper treatment. You can help by checking your horse’s legs daily before the disease develops. West Nile Virus is carried by mosquitoes and whose bite can cause encephalitis (brain inflammation) and meningitis (inflammation of the lining of the brain and spinal cord). Some signs of illness are fever, weakness and/or paralysis of hind legs, walking aimlessly, convulsions, inablility to swallow. At present the only treatment is supportive veterinary care. Equine Protozoal Myeloencephalitis (EPM)is a neurological disease caused by the horse ingesting feed that has feces of the opossum in it. The organisms in the feces can cause lesions on the brain stem and spinal cord. Symptoms include sore back, weakness, loss of coordination, droopy eyelid, tilting of the head. A blood test or spinal fluid test will determine if your horse has EPM. Leukoderma or Vitiligo Symptoms are loss of pigmentation in skin or hair and can be caused by a number of things such as lupus, frostbite and burns. It is not life-threatening and at present there doesn’t appear to be any treatment. However have your vet check your horse. Swamp Fever or Equine Infectious Anemia (EIA) is caused by horses biting insects including mosquitoes. Symtoms include fever, weakness, coordination loss. The horse may eventually evelop jaundice, fluid retention and mucous membrane lesions. 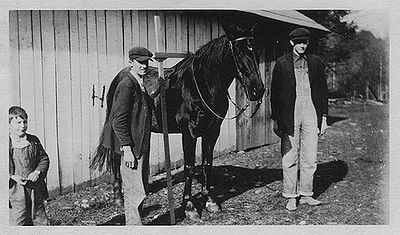 There is a test (called Coggins) that can determine if your horse is a carrier. Warts sometimes will fall off by themselves, but consult your vet for treatment.